As IT organizations are under pressure to increase their effectiveness, while reducing costs, many are applying traditional processes and tools that have been used for enterprise asset management to their IT assets. The IBM Tivoli Maximo Asset Management product, rebranded after the acquisition of MRO by IBM, is an example of an industry leading tool for managing enterprise assets. The IBM Tivoli Asset Management for IT product is based on the same foundation as Maximo Asset Management and provides additional capabilities targeted for the management of IT assets (both hardware and software). 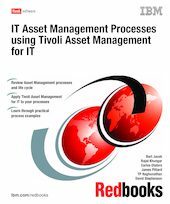 This IBM Redbooks publication describes current industry trends and thought leadership on IT asset management and describes how the IBM Tivoli Asset Management for IT V7.1 product can help implement and support IT asset management processes. This book is not intended to teach readers about Tivoli Asset Management for IT V7.1, but rather assumes they are familiar with Maximo Asset Management and can access Asset Management for IT V7.1 documentation. This book does provide high-level overviews, using product-specific terminology, describing how the product capabilities can enhance the implementation and automation of common IT asset management processes.